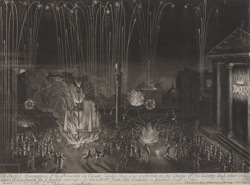 View of fireworks in Covent Garden to celebrate William III's victory in Ireland in July 1690. This conflict at the Battle of the Boyne defeated the deposed English monarch James III and his Irish supporters. Covent Garden was a residential area at this time. The Earl of Bedford, who owned the land, had employed Inigo Jones to build a square with St Paul's Church and three sides of terraced housing in the 1630's. For a short time it became a fashionable place to live, but the development of the market in the later 17th century meant it became less popular.